This tricycle is tough enough for the bravest little dudes out there. This rad ride is a mini replica of a big time Harley-Davidson, complete with awesome details like the Harley-Davidson logo and colors. There’s even a secret storage space under the seat so he can pack his snacks, teddy bear or whatever else he needs before he hits the cul-de-sac. The only fuel it needs is his energy as he puts his feet to the pedals to go, go, go! It’s great exercise, and the thick rubber tires make it more stable and safe. Recommended for ages two to six, he’ll get years of use out of this hog, cruising around the neighborhood in style. Take a look at other product reviews and shop for the best ride-on toys available online. A staple in playrooms everywhere, these Mega Bloks are a perfect first foray into the world of block building. This classic set comes with 80 brightly colored blocks for tons of building fun, and clean up is easy as they come in their own storage bag. Made for little fingers, they’re perfect size for stacking, building and smashing… then starting all over again. They can create towers, buildings, creatures, and whatever their little minds can dream up. It’s a great activity to build motor skills and bring out their creativity too. These are also compatible with other Mega Blok sets, so you can continue to build on the fun with the purchase of other sets for even bigger and more impressive designs. At the end of sweaty, sticky day, toddler boys need to hit the bath, but getting them into the tub isn’t always the easiest feat. This fleet of brightly colored boats, however, will have them begging to dive right in. Four boats come in a pack, and they each have magnets so they can hook to one another to form a bathtub boat parade. They can also be used in a pool, sink or even on dry land for hours of imaginative play. Little boys will love to race them, sink they, crash them—whatever floats their boat—and meanwhile they’re getting a great bath. The boats also decorated with numbers for a little splash of education as well. Talk about good, clean fun! Check out other reviews of the best bath toys you can buy now. Let his creativity fly free with this huge magic water drawing mat. No messy paints or markers needed. It comes with two pens that write like magic on the pad after you fill them with water, but they won’t leave a mark on walls, carpets or other surfaces. The drawings will magically disappear after a few minutes, then he can start all over again. The mat is 31.5" x 23.6", which gives him tons of territory to cover and allows more than one child to draw at the same time. It also folds up in a snap so that you can throw it in a bag for fun on the go. The best part: No mess, no matter where you take it. Around the age of 2, they'll start to fine tune some of their fine motor skills and some will be able to identify shapes, animals, and such. Why not indulge all of these new milestones with a fun wooden puzzle that will have them saying "roar" and more. Parents are fond of toys by Melissa and Doug because they are often made of wood and not plastic. They'll delight in watching their child try to figure out where all the pieces go and the 2-year-old will be so proud when they accomplish it. Boys (and girls alike!) are fascinated by trucks. Why not indulge their interests with a toy dump truck that they can play with for hours on end. Green Toys are made with environmentally friendly materials that are free from BPA so you know your child will be safe. This dump truck will help them work on both their gross motor skills as the zoom this around the house and their fine motor skills as they try and figure out how to dump the "trash" out. Over 1,500 customers give this toy glowing reviews remarking on the quality of the truck and its lifespan in the toy chest, with many saying their child played with till the age of 10! Cha-ching! He’ll be ringing up customers left and right with this awesome little interactive cash register set. It includes the register with a scale for weighing food, a credit card scanner and a pretend credit card, of course. It also comes with a shopping basket and 10 pieces of healthy plastic food like fish, grapes and milk—no cookies or ice cream here. The battery-operated cash register (two AA batteries are required, but not included) plays more than 80 different songs, sounds and phrases with the touch of a light-up button or a swipe of the card. The cash drawer opens and closes, and rollers at the top spin and feature cute customer faces. Kids will love playing store while they’re learning colors, numbers and so much more. Strike up the band! This colorful music set has everything he needs to make beautiful melodies (or something like that). Included in the set are a xylophone, maracas, sleigh bells, castanets, blocks and a drum. Whether he’s going to play as a one-man band or get friends or even the entire family involved, there’s something for everyone to play. It all comes in a carrying bag, which makes it easy to clean up, store and take the show on the road to grandma’s house or wherever you may be headed. It’s a great way to inspire musical interest at a young age, helps develop hand-eye coordination, and it’s just a heck of a lot of fun to let loose and see where the rhythm takes them. If the beat goes on and on a little too long for mom and dad, there’s always earplugs. Hold the phone! Here’s a perfect, inexpensive toy for a little boy. Everyone else is always on their phone, so of course, the little guy is going to want to be on his too. This one isn’t for scrolling through Facebook and posting pics of their dinner on Instagram (though wouldn’t that be fun? ), but rather it’s full of all sorts of educational opportunities at the touch of a button. It comes with 10 apps that include music, photos and games that teach skills like numbers, letters and time. There are five fun ringtones, and they can even store their favorite numbers in their own phonebook. Don’t worry, they won’t be ringing someone in the middle of the night though. It’s all just pretend, which is great for inspiring imaginative play and saving your data plan. Two AAA batteries are required. We bought two top-rated toys for 2-year-old boys that our reviewers tested for eight hours. We asked our testers to consider the most important features when using these toys, from age appropriateness to skill development. We’ve outlined the key takeaways here so that you, too, know what to look for when shopping. Age appropriate When purchasing toys for young children, it’s crucial to ensure the products are age appropriate. Some toys have small pieces that can pose a choking hazard for little ones, so make sure you check to see if the product’s age recommendation includes 2-year-olds. Skill development Two is a key developmental age where toddlers are learning all sorts of physical and mental skills. At this age, 2-year-old boys will need to practice walking, pulling items, building block towers, holding crayons, doing small puzzles, and more. As such, it’s often beneficial to purchase toys that encourage toddlers to further these skills. Open-ended play In addition to practicing developmental skills, 2-year-olds often benefit from toys that encourage open-ended play. For instance, a musical toy with a few preset buttons won’t be as engaging as, say, a bucket of blocks that can yield an infinite number of creations. As an added bonus, these open-ended toys can often grow with your child, providing several years of entertainment. 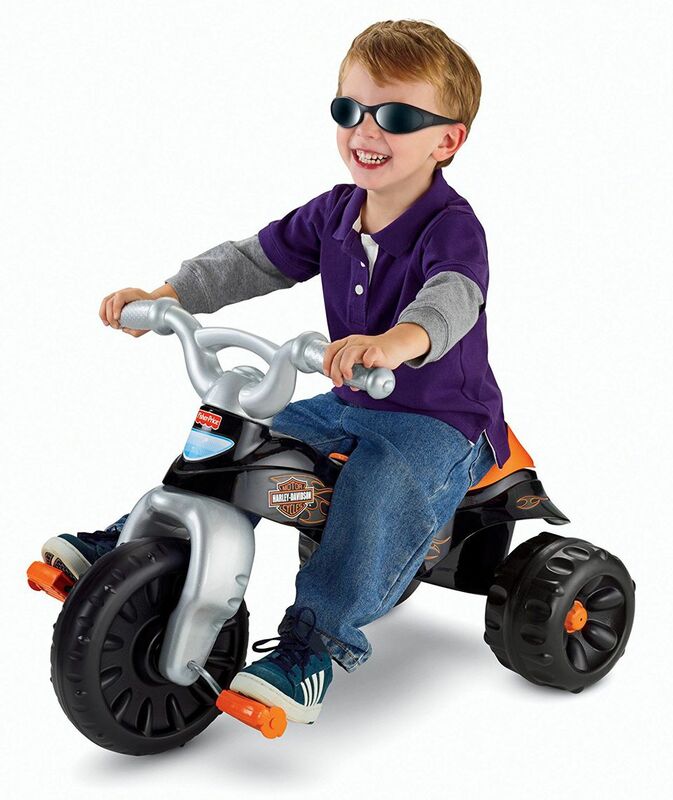 Our reviewers liked the design, ease of use, and entertainment value of the Fisher-Price Harley-Davidson Tough Trike. “My child loved the toy and wanted to ride it all day,” gushed one of our testers. According to our reviewers, the trike was also great for teaching motor skills. One of our testers explained, “Children are able to ride (move) the bike on their own by pedaling. This gives them an understanding of movement, transportation, and they feel a sense of ownership when they play with this product.” Online reviewers noted that some 2-year-olds have difficulty reaching the pedals, so it’s good to be aware of the trike’s measurements when purchasing. Our testers liked the size of the blocks, the convenient storage bag, and that the blocks are appropriate for younger kids, too. “They are uniquely large blocks and are rated for children as young as 12 months, while most competitors only go as low as 18 months,” explained one of our reviewers. On the flip side, one of our testers noted, “Their size makes them less challenging and less interesting for children as they grow, so the entertainment value is limited.” Our reviewers also wished they were easier to clean.